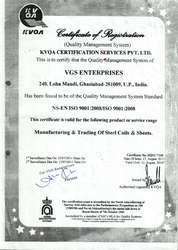 We VGS Enterprises, established in 1997, is a third generation iron and Steel industrial enterprise. Our company has been providing technically sound, world class roofing & cladding solutions, since the last two decades. We are a prime manufacturer of industrial Roofing & Cladding Solutions based in India.Besides Our expertise in designing & manufacturing we also undertake erectioning /execution of industrial Roofing as well as Pre-Engineered Steel funding solutions.We have covered more than 10 million square feet of roofing and cladding for some of the top corporate houses and prestigious construction companies. We offer superior industrial Roofing & Cladding Solutions that are developed using finest quality material.Is that makes the industrial Roofing & Cladding Solutions highly durable M nature. We are pioneers in offering Industrial Roofing & Cladding Solutions that are exactly developed in line with the specifications detailed by our clients. At VGS, we focus on meeting our dientele demands for d ura ble, affordable, and versatile Industrial Roofing Solutions. We keep in mind the future requirements of our clients in mind while designing, developing and erecting our ranged industrial Roofing Sol utions. We have certified and experienced engineers who specialize in the designing and manufacturing of the industrial Roofing & Cladding Solutions. Our engineers are known for providing customized solutions and timely completion of the Industrial Roofing Solutions. Our professionally designed and structured industrial Roofing & Cladding Solutions have smart & aesthetic detailing and appearance. The benefits of our industrial Roofing & Cladding Solutions when compared to its counterparts in the market are low investment, faster completion time and infinite choice of layouts and inherent resistant to earthquakes. Our Industrial Roofing & cladding Solutions also incurverylow maintenance costs. 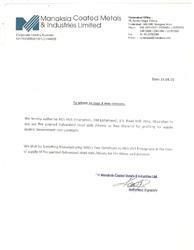 Manufacturing and Trading of Coil and Sheet and Steel Coil and Steel Plates. With our comprehensive knowledge in this domain, we have gained a strong vendor base. The offered range of Rolled Steel Plate and Coil. etc. is sourced from only authorized and experienced vendors of the market. With the help of our trustworthy vendors, we are able to satisfy clients’ exact demands in a timely manner, irrelevant of the quantity ordered. Our team of adroit professionals deeply examines the vendors on varied parameters and accordingly picks the best ones who are highly seasoned and knowledgeable of their respective domains. We have authorised distributors of steel authority of India Ltd. (SAIL) and have been associated with them for the last 25 years. 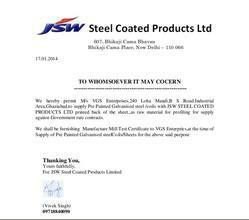 we have also authorized distributors of JINDAL Steel. We have a network of agents at both SAIL and JINDAL's respective works across the country.Our head office is located in new Delhi with branches/resellers in various part of the country. Given below is the list of our esteemed customer with whom we have been enjoying a long term business relationship.